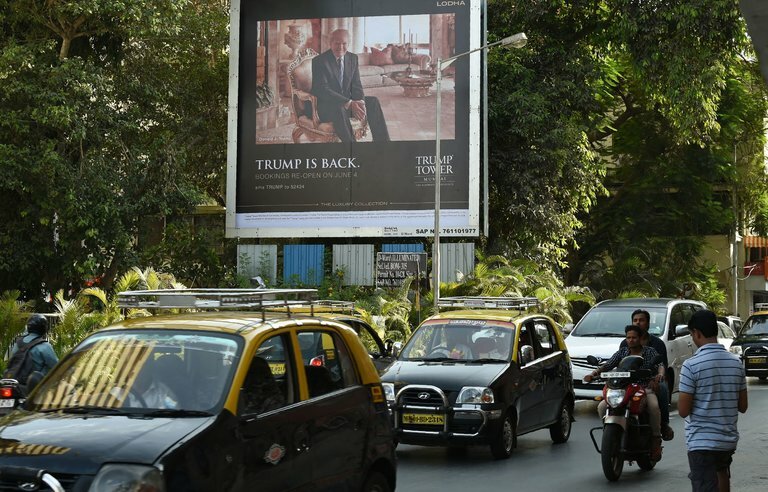 A billboard for Trump Tower Mumbai in India. Donald J. Trump met this week with businessmen linked to the building. WASHINGTON — President-elect Donald J. Trump met in the last week in his office at Trump Tower with three Indian business partners who are building a Trump-branded luxury apartment complex south of Mumbai, raising new questions about how he will separate his business dealings from the work of the government once he is in the White House. A spokeswoman for Mr. Trump described the meeting as a courtesy call by the three Indian real estate executives, who flew from India to congratulate Mr. Trump on his election victory. In a picture posted on Twitter, all four men are smiling and giving a thumbs-up. “It was not a formal meeting of any kind,” Breanna Butler, a spokeswoman for the Trump Organization, said when asked about the meeting on Saturday. One of the businessmen, Sagar Chordia, posted photographs on Facebook on Wednesday showing that he also met with Ivanka Trump and Eric Trump. Mr. Trump’s children are helping to run his businesses as they play a part in the presidential transition. Ms. Butler and Hope Hicks, a spokeswoman for Mr. Trump, declined to comment when asked on Saturday if the meeting with the Trump family members included any discussion of Trump businesses in India or expanding that business. The three Indian executives — Sagar Chordia, Atul Chordia, and Kalpesh Mehta — have been quoted in Indian newspapers, including The Economic Times, as saying they have discussed expanding their partnership with the Trump Organization now that Mr. Trump is president-elect. Sagar Chordia did not respond to a request for a telephone interview. But in a series of text messages with The New York Times early Sunday, he confirmed that the meeting with Mr. Trump and members of his family had taken place, and that an article written about it in the Indian newspaper, which reported that one of his partners said they had discussed the desire to expand the deals with the Trump family, was accurate. Washington ethics lawyers said that a meeting with Indian real estate partners, regardless of what was discussed, raised conflict of interest questions for Mr. Trump, who could be perceived as using the presidency to advance his business interests. In an account of the meeting that appeared in The Economic Times, Mr. Trump was quoted as praising the United States’ relationship with India and its prime minister, Narendra Modi. The Economic Times reported that the meeting occurred on Tuesday. A spokeswoman for the Trump Organization would not confirm the day of the meeting. Internationally, many properties that bear Mr. Trump’s name are the result of marketing deals — like the one in India — in which he is paid by someone for the use of his name but does not actually own the underlying property. He has such marketing agreements in South Korea, the United Arab Emirates, Uruguay, the Philippines and Turkey, according to a list published by his company. Atul Chordia and Sagar Chordia are well-known figures in real estate in Pune, a city of about three million people in the western Indian state of Maharashtra. Their father, Ishwardas Chordia, was born into a family of sugar traders, but as a young man forged a close friendship with Sharad Pawar, who became an important politician in Maharashtra and now sits in the upper house of India’s Parliament. Beginning in the 1990s, Chordia businesses built luxury hotels, corporate parks and residential projects in upscale neighborhoods in Pune. The third executive at the meeting, Mr. Mehta, is the managing partner of a real-estate firm named Tribeca, which is also a part of the Trump projects in India, which go by names including Trump Towers Pune and Trump Towers Mumbai. Dave Besseling, a former deputy editor at GQ India, hosted an event at Sagar Chordia’s hotel during the 2016 presidential campaign and said Mr. Chordia expressed “elation” about Mr. Trump’s candidacy and the opportunities it would bring. The same week, Mr. Trump’s daughter Ivanka — an executive at the Trump Organization hotel chain — attended a meeting with Prime Minister Shinzo Abe of Japan. The move drew criticism from former State Department officials, given that Ms. Trump does not have security clearance and is helping run the family business enterprises. Separately, The Washington Post reported on Saturday that the recently opened Trump International Hotel in Washington invited representatives from local embassies to the hotel after the election to encourage them to use it when leaders from their countries visited Washington. Ms. Butler, the spokeswoman for the Trump Organization, said the family was moving to try to formally separate Mr. Trump from his family’s business ventures. “Mr. Trump is not going to have dealings in the day-to-day business of that organization,” she said. Asked if such a separation had already taken place in the aftermath of the election, she said she did not know.